The Ultimate in Mountain Elegance! Exquisite and inspiring, this contemporary luxury home surrounded by lush mountain landscape and spectacular vistas that spread out for miles, invites you into an experience you won’t forget. “Loblolly”, named for the tall pines etched along the curved drive, is a Frank Lloyd Wright inspired home of the Laurel Ridge Country Club. Lounging on the tiled three sided terrace, the layers of mountain vistas mesmerize as you breathe in the cool mountain air. A flock of turkeys meander by, the trees softly sing in the breeze, and the sun passes gently from dawn to dusk painting the sky in a rainbow of pastels. The experience continues indoors as the sheer beauty of nature graces every window. The stunning gallery main entrance lined with striking artwork and sculpture leads to a soaring living room encircled by mountain view windows. With high-end furnishings throughout the home, the open living design is centered by a two-story stone fireplace where the hearth offers seating to warm on winter days and nights. Seated in front of the fire centerpiece, conversations abound, or meander over to the piano and be entertained by the magic of music. 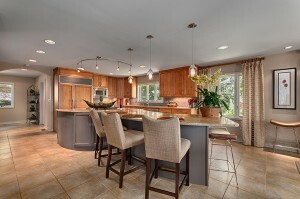 The kitchen and keeping room create an oasis of its own. 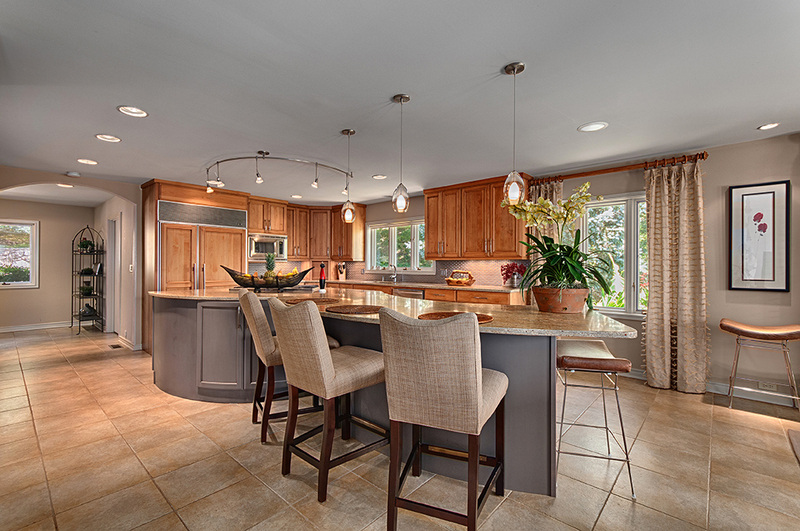 The aroma of cooking permeates your senses, and the chef will delight in the kitchen layout. Double oven, island gas burner stove, and the curved island are all aesthetically pleasing as well as practical. 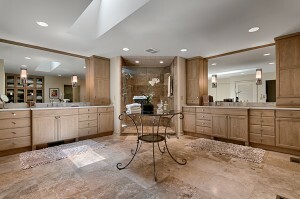 The butler’s pantry is fully equipped with ice maker and wine fridge to serve your guests with ease. Enjoy the dining area for large or small parties, as the glow of twilight alights the room and the majesty of the mountains show off the colors of sunset. Featured on the main level is the presidential master suite with its own terrace walkout where you can witness the myriad of stars before retiring for the night. Spacious and elegant, this sanctuary is completed by an ensuite bath with his and her sinks, vanities and walk-in closets, shower and private toilette. The coffee bar and refreshment center is adjacent in the exercise room where you can work out and then soak in the jetted tub while delighting in the mountain views. The upstairs den and office is lined by wormy chestnut wood and mountain views which makes for a warm and inviting space and leads to the second master suite with sitting area and third guest bedroom ensuite. Your guests will enjoy privacy while taking in scenic views. Loblolly sits above Laurel Ridge Country Club where social, sports and golf memberships are available featuring one of the area’s most beautiful and challenging 18-hole golf courses, tennis, swimming pool and award winning culinary dining. 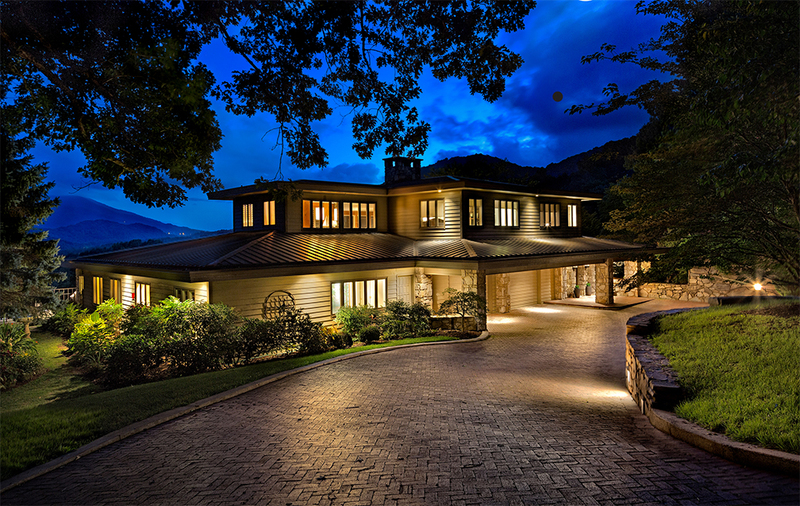 Undeniably one of Western North Carolina’s most exquisite luxury homes is this masterpiece of elegance with impeccable attention to light and flow, creating intimacy and beauty at every turn throughout the home! 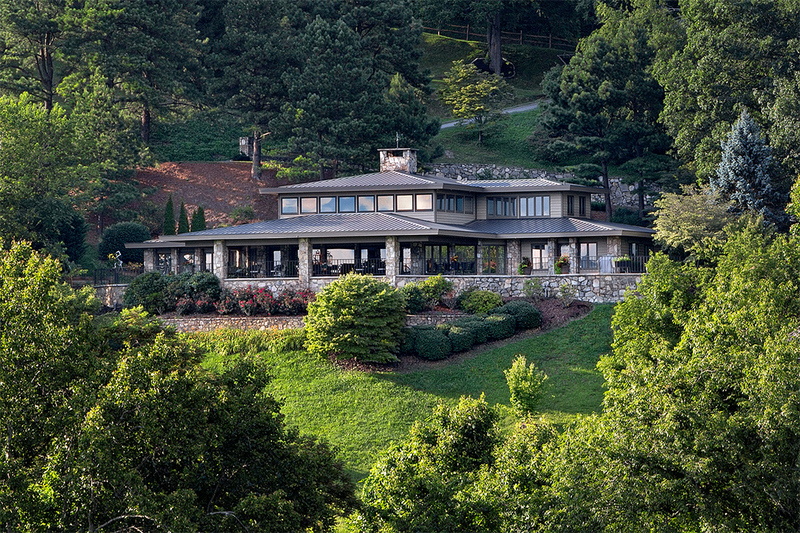 Enjoy the finest of life in this exquisite home in the Laurel Ridge Community in Waynesville!